Volatile constituents obtained by autolysis of aerial and underground parts of D. sophia and the essential oil obtained by hydrodistillation of whole plant samples were analyzed in detail by GC and GC-MS. In total, 71 constituents were identified, accounting for more than 90% of the total peak areas in the chromatograms. Both aerial and underground autolysates contained considerable amounts of lignan arctigenin and cuticular wax compounds. The essential oil was dominated by glucosinolate breakdown product 4-pentenenitrile. 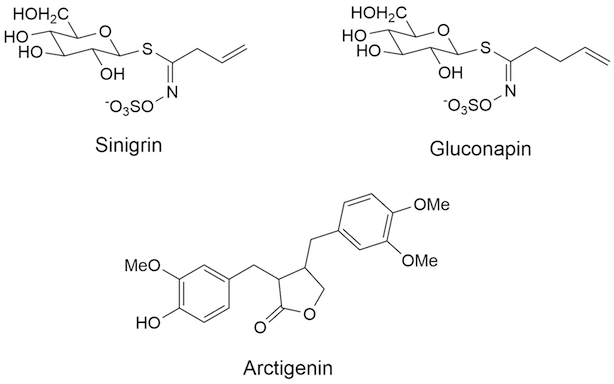 Glucosinolate degradation products identified in the essential oil and autolysates, 3-butenyl isothiocyanate, 4-pentenenitrile and allyl isothiocyanate, suggested the presence of gluconapin and sinigrin in this species as the most likely “mustard oil” precursors. Volatile constituents of Descurainia sophia essential oil and autolysates were analyzed in detail by GC and GC-MS. The analyses allowed the identification of 71 compounds in total. Descurainia sophia contains glucosinolates gluconapin and sinigrin and lignan arctigenin. Adams, R.P., 2007. Identification of Essential Oil Components by Gas Chromatography/Mass Spectrometry, fourth ed., Allured Publishing Corp., Carol Stream, IL. Aghaabbasi, K., Dehghan, E., Baghizadeh, A., Dashti, H., 2014. Zahedan J. Res. Med. Sci., 16, 27‒32. Baslas, K.K., 1959. Indian J. Appl. Chem., 22, 122‒124. Chen, Y.Q., Li, R.Z., Wang, Y.W., 1981. Acta Pharm. Sin., 16, 62–64. Chen, J., Guan, R., 2006. Xibei Zhiwu Xuebao, 26, 1231‒1235. Clevenger, J.P., 1928. Am. Perfumer Essential Oil Rev., 23, 467‒503. Diklić, N., 1972. Genus Descurainia Webb et Berth., in: Flora of Serbia Josifović, M. (Ed. ), Flora of Serbia, vol. 3. Srpska akademija nauka i umetnosti, Belgrade, pp. 189–190. Mohamed, N.H., Mahrous, A.E., 2009. Rec. Nat. Prod., 3, 58–67. Omaki, T., 1935. Yakugaku zasshi, 55, 816–827. Redovnikovic, I.R., Glivetic, T., Delonga, K., Vorkapic-Furac, J., 2008. Period Biol., 110, 297–309. Shi, X., 2011. Zhongguo Youzhi, 36, 40–42. Sun, K., Li, X., 2003. Zhongguo Yaowu Huaxue Zazhi, 13, 233–248. Sun, K., Li, X., Li, W., Wang, J.H., Liu, J.M., Sha, Y., 2005. Pharmazie, 60, 717–718. Wang, A.Q., Wang, X.K., Li, J.L., Cui, X.Y., 2004. Acta Pharm. Sin., 39, 46–51.